Previous Post New year, new language? Language learning resolutions for 2019. Thank you so much for reblogging my post! 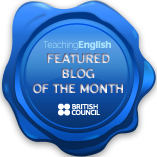 I feel really honoured as I am a great fan of your blog and have used many of your lesson plans with my C level classes. Thanks for your generosity. No problem at all! I hope you don’t mind but I’m giving a training session on teaching proficiency and I’m going to suggest your roles for reading circles, I’ll give you full credit of course. That’s absolutely fine, I hope it goes well.